Far away in a small town in South Carolina, former cop Tim Jamieson has taken a job working for the local Sherriff. He's basically just walking the beat. But he's about to take on the biggest case of his career. Back in the Institute's downtrodden playground and corridors where posters advertise 'just another day in paradise', Luke, his friend Kalisha and the other kids are in no doubt that they are prisoners, not guests. And there is no hope of escape. But great events can turn on small hinges and Luke is about to team up with a new, even younger recruit, Avery Dixon, whose ability to read minds is off the scale. While the Institute may want to harness their powers for covert ends, the combined intelligence of Luke and Avery is beyond anything that even those who run the experiments - even the infamous Mrs Sigsby - suspect. 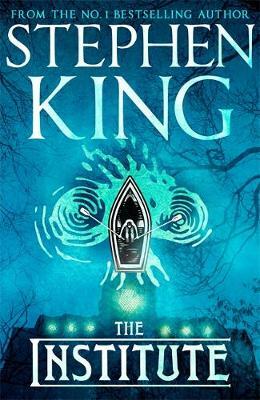 King is described by the Guardian as 'one of the greatest storytellers of our time', by the Mirror as a 'genius' and by The Sunday Times as 'one of the most fertile storytellers of the modern novel'. He is the author of more than sixty books including the No. 1 bestselling novel THE OUTSIDER, voted winner of the Goodreads Choice Award for best Mystery and Thriller 2018 and the classic IT, 'a book which speaks to everybody' - Guardian. Many of his titles have been turned into films, TV series and streamed events including MISERY, PET SEMATARY, THE SHAWSHANK REDEMPTION and MR MERCEDES. King was the recipient of America's prestigious 2014 National Medal of Arts and the 2003 National Book Foundation Medal for distinguished contribution to American Letters. In 2007 he also won the Grand Master Award from the Mystery Writers of America. He lives with his wife Tabitha King in Maine.